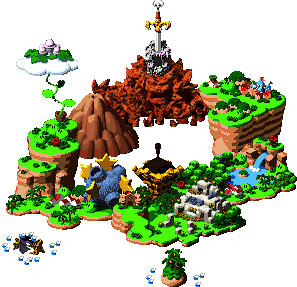 Seaside Town is a coastal resort village found in the game Super Mario RPG: Legend of the Seven Stars. The town was conquered by the mechanical Yaridovich during the events of the game. Besides locking up the Seaside citizens in a large shed, Yaridovich also disguised himself as the town's entire population. The mechanical creature used this elaborate ruse to trick Mario into acquiring a Star Piece for the "Elder." None of the fake citizens seem to speak very well, as there are pauses in their conversation. Two fake citizens guard the building where all of the real citizens are locked up. Seaside Town has more shops than any other village in the game, and houses a company known as "Beetles Are Us." At Beetles Are Us, Mario can buy a Beetle Box from the resident Snifit and can then catch beetles at Booster Hill for Coins. Additionally, there is a boy from Rose Town who will taste Mario's Mushrooms, and will give Mario a special item if the Mushrooms are of a rare variety. Frogfucius' Student lives here as well, and will trade special accessories for Frog Coins. Seaside Town contains only three buildings that are not shops: the Elder's house, the Inn, and the large shed. When Yaridovich controls the city (before obtaining the Star Piece), he sells the Fright, Fire and Ice Bombs, Muku Cookies and Bad Mushrooms. This is the only point in the game where any of these items can be bought from a regular store, and the only method in the entire game to obtain the latter two items. Before Mario and his party got to Seaside Town, Yaridovich conquers the town, locking up all of the residents. He then assumes multiple forms disguised as the residents. Mario eventually reaches Seaside Town. The fake Elder urges Mario to head to the Sunken Ship to retrieve a star for him. After getting the fifth Star Piece from Jonathan Jones, the fake Elder takes the Star Piece. The fake Elder expects Blade to pick him up, but he doesn't arrive. Jonathan Jones then appears to confront Yaridovich, who reveals his true form. Mario, Mallow, Geno, Bowser and Peach battle him, and ultimately, Yaridovich is defeated. Afterward, Mario regains custody of the Star Piece, and the residents of the village are freed. This page was last edited on February 22, 2019, at 14:41.